Allstate Insurance Company of Canada is pleased to announce its renewed support to the Mission. With a new donation of $10,000, the Mission will be able to fund part of its renovation project in the Patricia Mackenzie Pavilion, a unit entirely dedicated to helping homeless women. Allstate Canada’s donation will help fund much needed plumbing work, a new sink, and other essential kitchen equipment and appliances. Through the Patricia Mackenzie Pavilion kitchen renovation project, the Mission will be able to better respond to the growing number of women knocking at its door. With the recent changes in services offered, it’s necessary to restructure the current facilities in order to increase functionality and reduce costs. 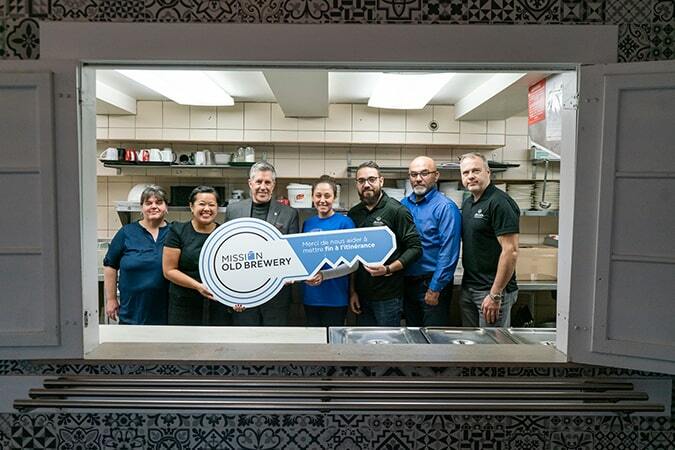 Over the last four years, Allstate Canada and their local Montreal Agencies have been supporting the Old Brewery Mission as part of their community giveback. After helping to alleviate the costs of a new medical clinic at the Webster Pavilion in 2015, participating in the Grand Project in 2016, and financing the acquisition of an automatic floor scrubber in 2017, Allstate Canada is proud to continue its support and to make a difference in the lives of so many women.